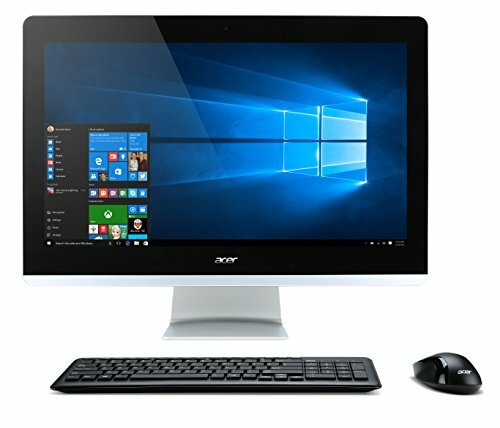 The Acer Aspire AZ3-715-ACKi5 is an entry-level all-in-one desktop with a 23.8-inch Full HD touch panel, enough storage space, and delivers good multimedia and day-to-day performance, thanks to a powerful Core i5 processor and 12GB of RAM. However, its slow-booting hard drive, dated design and lack of forward-thinking ports like USB-C or Thunderbolt 3 seem like serious tradeoffs–though not prohibitively so. If you’re in business, the HP Envy 27-b110 All-in-One desktop presents a shoo-in for the creative departments, with its Full HD screen, powerful processor and graphics, excellent connectivity and a refreshed design that look like a standalone display. It remains our Editors’ Choice for business all-in-one (AIO) desktops. The Aspire AZ3’s components are conveniently built into the back of a 23.8-inch In-Plane Switching (IPS) display. Measuring 18.4 by 23.3 by 1.4 inches (HWD), it is fairly larger than the 21.5-inch Apple iMac, but similar in height with most AIO desktops. The display is floated by a non-removable, bright silver-colored L-shaped stand, which mimics the stand on the latest Apple iMac. While the stand looks easy on the eyes and allows the display to tilt, it lacks height or swivel adjustments, but it does blend well with the silver-colored trim around the screen. Overall, the design looks attractive, though a bit dated. The Acer Aspire AZ3-715-ACKi5 is capable all-in-one desktop PC, that has the power to get the job thanks to a seventh generation Core i5 processor, 12GB memory and tons of storage. Even with a few flaws, it still, is, a prime choice for day-to-day computing needs and media consumption.